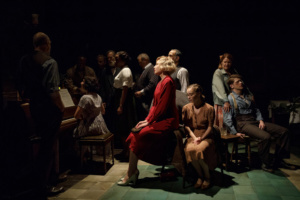 If you think the times we are living in are depressing, Girl From The North Country, now playing at The Public Theatre, is here to show you what depressing really is. Bob Dylan’s songbook has never sounded better. His music uncategorically resonates to the heart and soul of rural America. Dylan’s lyrics incorporate a wide range of political, social, philosophical, and literary influences. 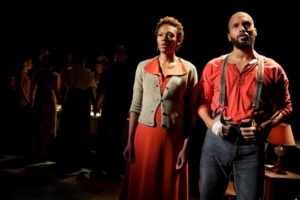 The show seems as if it was written by John Steinbeck or a despondent Henry David Thoreau. Conor McPherson has set his musical in 1934, during the heart of the Great Depression, in a Duluth boarding house owned by Nick Laine (Stephen Bogardus, Falsettos, TV’s The Blacklist) and his wife Elizabeth (Mare Winningham, The Affair, American Horror Story), who no longer loves him and whose grief is eating away at her, making her live in her own world. The tenets owe them money and now the bank is about to foreclose. Their son, Gene (Colton Ryan), is an alcoholic, and their adopted African American daughter, Marianne (Kimber Sprawl), is pregnant and abandoned. Staying in the house is Mrs. Nelson (Jeannette Bayardelle), a widow who is expecting some money and is having an affair with Nick, a failed businessman (Mark Kudisch), his wife (Luba Mason) and their adult son who has the mind of a child (Todd Almond). Stopping by is the elderly shoe salesman who wants to marry the younger Marianne, Gene’s soon-to-be-ex-girlfriend (Caitlin Houlahan), and the narrator of sorts, a morphine-addicted doctor (Robert Joy) who helps other’s out of their misery with pills. When Rev. Marlowe (David Pittu), a corrupt bible salesman, and an ex-con/former prizefighter, Joe Scott (Sydney James Harcourt), show up in the middle of the night, things take a turn for the worse. As Thanksgiving approaches, who lives, who survives, and who makes it through these rough times is told through song. As the show and the Depression come to an end, we stay “Forever Young”, or do we? Mare Winningham makes the iconic “Like a Rolling Stone” seem like an anthem of hope and resolution. “How does it feel, to be on your own, with no direction home, a complete unknown, like a rolling stone?” We feel for her and wish she was not in such pain. The actors all play instruments, as well as sing powerful numbers that break your heart or uplift. Ms. Mason has two of the most powerful acting moments in the show, as we see her descent into addiction thanks to no longer being able to deal with life’s blows. But this is a true ensemble piece that is well done at every turn and I hope the Drama Desk acknowledges this in the ensemble category. Highlights of the Dylan repertoire include: Ryan and Houlahan bring the passion of lost love to “I Want You”. Mr. Harcourt has powerful moments with “Slow Train” and “Hurricane”. Almond’s “Duquesne Whistle” knocks the roof off. The Dylan songs have been rearranged, so you get a mixture of soul, gospel, and blues. Kudos to Simon Hale’s lush orchestrations. 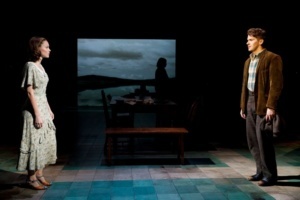 Set and costume designer, Rae Smith, emulates Edward Hopper’s paintings both in projections and color scheme. She is helped with mood lighting by Mark Henderson. The direction by McPherson bounces between the boarding house and standing microphones that make it seem as if we are at a 1930’s radio set. This might make more sense if the inhabitants were listening to the radio. Though we completely know who each of these people are, I never fully understood why we kept stepping out of the action. 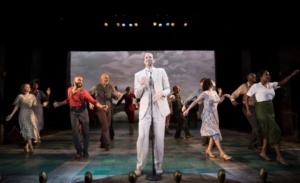 He is helped by movement director Lucy Hind, who did at least make this seamless. Issues of racism, abuse, murder, blackmail, adultery, unemployment, and loss are tackled but only for a moment and are not given “A License to Kill”. Everyone has a story, a past with hurt and longing. Conor McPherson uses the music of Dylan to flesh these emotions out and we become a traveler of the past. 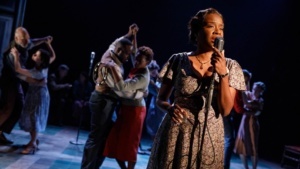 Girl from the North Country: The Publis Theatre, 425 Lafayette St. until Dec. 23rd. She Says: I Was Most Alive With You, But the Question is, Who?